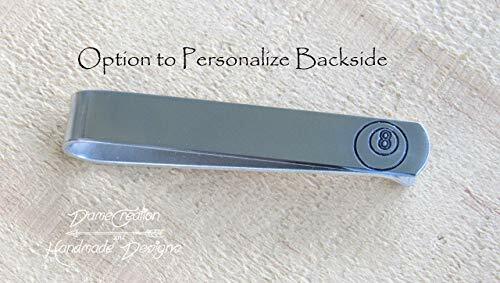 Eightball tie clip!!! Made of strong 16-gauge 3003 aluminum that has been tumbled to shine. You can choose to have 18-gauge brass or copper as well, they are the same size. Made to clip to the tie and shirt snugly but will give for a thicker tie. If you need more quantities just message me! Also these can be sized short for skinny ties if necessary!